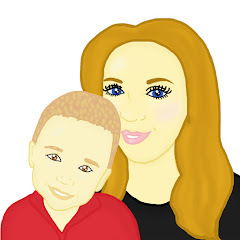 Are you looking for fun learning toys to keep your little ones busy? Entertaining, good quality and unique? Maxwell loves reading and is into lots of children's stories, one book he loves is Winnie The Pooh. 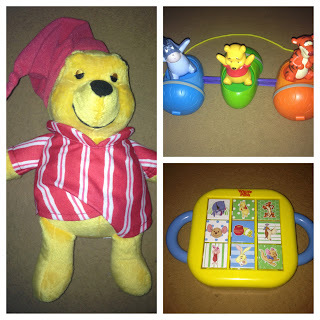 Winnie the Pooh is a well known family friend who has been around for years so when TOMY sent us 3 brand new toys for Maxwell to play with, we were both very excited. Cuddle and Glow Pooh is a soft cuddly toy designed for children to take to bed. He is suitable for children from birth. When Pooh is cuddled his cheeks glow red and if you press his nose he plays 5 different lullabies. You are able to listen to Pooh snore and yawn or use the soft glow night light with or without the lullabies to help you child sleep. The Cuddle and Glow Pooh is very clever and has a automatic timer. You are able to set the toy to run for 10 or 20 mins and the toy will then turn itself off for the rest of the night. I like this design as it means I do not have to go and disturb Maxwell to turn it off once he is asleep. Batteries are included in the Cuddle and Glow Pooh so he is ready to go as soon as you get him. The battery compartment is easy to find so changing the batteries is not a problem. Being able to change the batteries means that Cuddle and Glow Pooh will last for years to come. Cuddle and Glow Pooh is the perfect size for Maxwell to cuddle and he is soft. Maxwell likes the night light that is in it and I found that the light that pooh gives off in his hat and cheeks is soothing and the light is not too bright and not too dim. The Winnie The Pooh Spin N Play Acon Train is a fun, simple toy which any child would enjoy. The train is brightly coloured and features 3 character characters - Winnie the Pooh, Tigger and Eeyore. The train is designed so that the child who is playing with it call pull it along and when they pull it along the characters spin around on their carriages. The characters can also be removed which is fun as you can make them sit in different carriages or use them for other play. They are great quality and have survived Maxwell having a chew on them as well as being thrown around. They are a large enough size not to get lost. This toy is not a toy which needs batteries and can be used inside and outside. I think it is the perfect toy to help children to walk. This toy is suitable for children aged 12 months +. The Twist and Turn Activity Toy is a fun, simple toy that Maxwell enjoys playing with. The toy has 9 plaques which have Winnie The Pooh Characters on and when you turn them, a new picture is shown. On each plaque there are 3 different pictures. The plaques are a triangle shape and are perfect for tiny little fingers. The toy has handles which make it easy for Maxwell to carry around and is a great size to take out in the car or on holidays. Maxwell enjoys spinning the plaques and since we have had the toy I have tried to teach Maxwell to match the characters up. This toy is a fun learning toy as well as a activity toy which is fun for children of a younger age. Is is suitable for children aged 6 months +. The Winnie the Pooh range is designed for children of the younger age. All toys in the range are brightly coloured and are very appealing. They are fun and all have a unique design which helps children to learn. Maxwell is 19 months and we found that he enjoyed all the toys we were sent. Our thoughts were very positive towards this range.